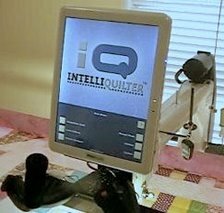 IntelliQuilter Training Videos: Wavy Rays. These were created in a two-step process first creating a path pattern, and then fanning that path pattern. Add/edit pattern > add pattern > block pattern > use current block. Select the straight line from the geometric catalog. Move it so the S snaps to the center of the block. Select stretch and anchor the start point. Grab the end point and move it to one of the corners. Finished. Add pattern > path pattern > select the straight line > choose arc-2 from the geometric catalog. Add/edit pattern > delete pattern > touch the straight line > continue > yes. Add pattern > fan pattern > select the wavy line > continue. Change the angle to 10º and repeats to 36. Grab the pivot point and move it to the other end of the wavy line. Transition: continuous. Close pattern: yes. Alternate: off. NOTE: If arc-2 in your geometric catalog is not horizontal, it will not connect as a continuous wavy line along the path. It must be altered and saved as a horizontal pattern. The same is true for arc. Try pathing other patterns – the rays don’t have to be straight lines. You will see a lot of overlapping at the center but since a no-sew zone will delete this area, the overlapping doesn’t matter.